HotelClub is an online, international group that helps you book accommodation all around the world. It has listed more than 74,000 hotels from over 141 countries on its website. Apart from that, the club gives some great membership options where you can get a great deal every time you book any accommodation. It includes member reward, member exclusives, priority club service, and many other services. Using these services, you can avail yourself of amenities like free transportation, pick-up service, free breakfast, travel insurance and many others. 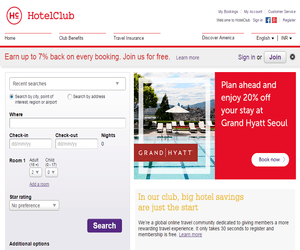 At ByDiscountCodes, we present so many great hotels and accommodation voucher codes for HotelClub. Here you can check out some of the best deals we offered for this hotel operator in the past. If you want to get more discount offers and promo codes for other travel agencies like Booking.com, you can also like our Facebook page where we share every update of new deals. How to Cash-in Your Latest Promotional Voucher? Copy the voucher or promo code from our store. Make a visit to https://www.hotelclub.com/. Provide location, check-in, check-out dates, and room details. Find “I have a promotional code” box. Paste your code there and click on “Search”. Choose the hotel and click on “Book”. Review and confirm your booking. HotelClub is an international community of travellers that offers some of the great deals for hotel booking to their members. All the members can use those special offers to get benefits like free Wi-Fi, free breakfast, or discounts on other stuff. And, if you want even better deals, then you must check out our regularly updated free discount codes, HotelClub promotional offers and many more deals on this page.